With the use of progressive tools, tackles and machinery, we are offering a wide range of Industrial SS Sigma Mixer to our customers. These offered products are designed and developed in line with the standards laid down by the industry. Moreover, these are checked sternly on a variety of measures prior final dispatch of the assignment. Miranda Automation offers Sigma Mixers. It is available in single arm and double "Z" arm types. It has jacketed bowl in MS/ SS and hydraulic tilting. It is compact and comes with fixed top cover and charging shoots. The unit can accommodate up to two independent dosing stations, which can even be of different capacities and be retrofitted to meet changing production needs. Each dosing station can be configured for individual capacities ranging from 1 g/sec, up to 170 kg/h. Controls: Standard or PLC as desired. 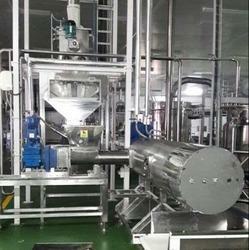 The Industrial Mixers we offer ensure high mixing efficiency in a lesser span of time. These industrial mixers are manufactured with our high-tech machines, which assures for their durability, flexibility and proper functioning. We are also capable to manufacture Mixers as per the requirements of the client and cater them in bulk too. Snowtech designs & manufactures custom-built mixing / agitation systems for diverse processes like Absorption / Blending / Crystallization / De-agglomeration / Diffusion / Dispersion / Dissolution / Emulsion / Extraction / Heat Transfer / Homogenizing / Reaction / Suspension. Reliable robust designs for super high performance and ease of maintenance.